Pop Bingo is a new fun, easy and engaging round for your pub quiz or alternatively a whole new night. It’s BINGO with singers and bands replacing the numbers. Each player/team is given a bingo-style sheet on which are the names of 20 artists. The DJ/quiz host plays from a list of 50 selected songs, the players simply mark-off the artists as they hear them. Play for a line and then a full house. 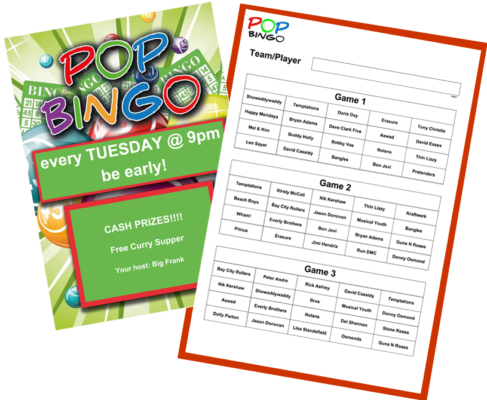 Custom build your Pop Bingo sheets to suit your players, their age groups and their musical ability. Great fun for everyone. See below for more info. Ready to create your unique Pop Bingo sheets? Just make your selection and click the ‘Create’ button. And don’t forget your FREE posters to promote your night. Pop Bingo makes for a terrific fundraising night. Ask for donations as prizes then sell the Pop Bingo sheets to raise funds. Best to use 3 games per sheet and sell them per sheet. A fun, engaging night with a few £££ raised for a good cause. First time here? Click below for help and more info. Pop Bingo is a fun, easy and engaging additional round for your pub quiz or alternatively a whole new night. Pop Bingo best suits a DJ or quiz host with a good selection of music or has a streaming subscription. Simple create an individual file/crate in your DJ software to list songs from the list of artists. Arrange the songs into a list and play a short snippet of each song in order. The host can make it as easy or as difficult as they prefer based on which track by that artist they choose to play, which part of that track and for how long. From there, it’s pretty much normal bingo, with the host deciding what prizes are available for what; maybe a lines, then two lines and then a full house etc. The Pop Bingo sheets are styled to best suit your crowd. Choose from ‘Older’, ‘Younger’ or ‘Mixed’ age groups or ‘Decades’ to best suit. You can also choose ‘more obscure artists’ if your crowd are more music savvy. A terrific fundraising night. Ask of donations as prizes then sell the Pop Bingo sheets to raise funds. A fun, engaging night with a few £££ raised for a good cause. Custom your Pop Bingo sheets to best suit your crowd. AGE GROUP – Select the age group to best suit your overall audience. DECADES – Select the decade to best suit your overall audience, or select All to cover all the decades. INCLUDE OBSCURE ARTISTS – Select Yes if your audience are more music savvy. NUMBER OF BINGO SHEETS – The number of bingo sheets per game; one for each audience member or team. HOW MANY GAMES – 1 for adding a round of Pop Bingo to your quiz night or 2/3 for a whole Pop Bingo Night. If you have any questions, or if there’s anything we can help with, please do get in touch.